Training Wheels Taleisin - Adventure Machine! 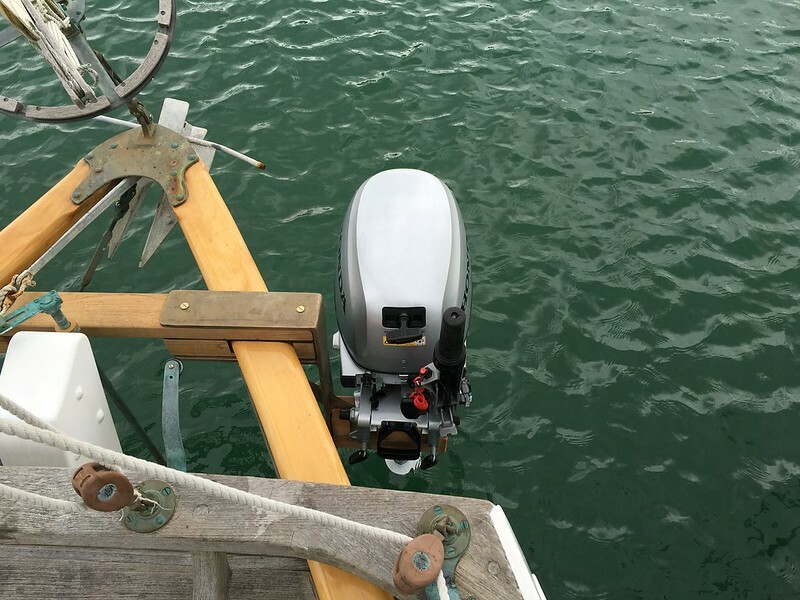 When we first bought Taleisin we considered getting an outboard mounted on the transom. We even got a boat builder out in the first couple of weeks of having her in the marina. If you’re familiar with Taleisin you’ll know that she was built and designed to hate motors. Nothing is easy with Taleisin, simple is not easy. Luckily I love a good challenge! After many talks with a lot of different people I finally came to the conclusion that I’m not likely to get a motor mounted on Taleisin. 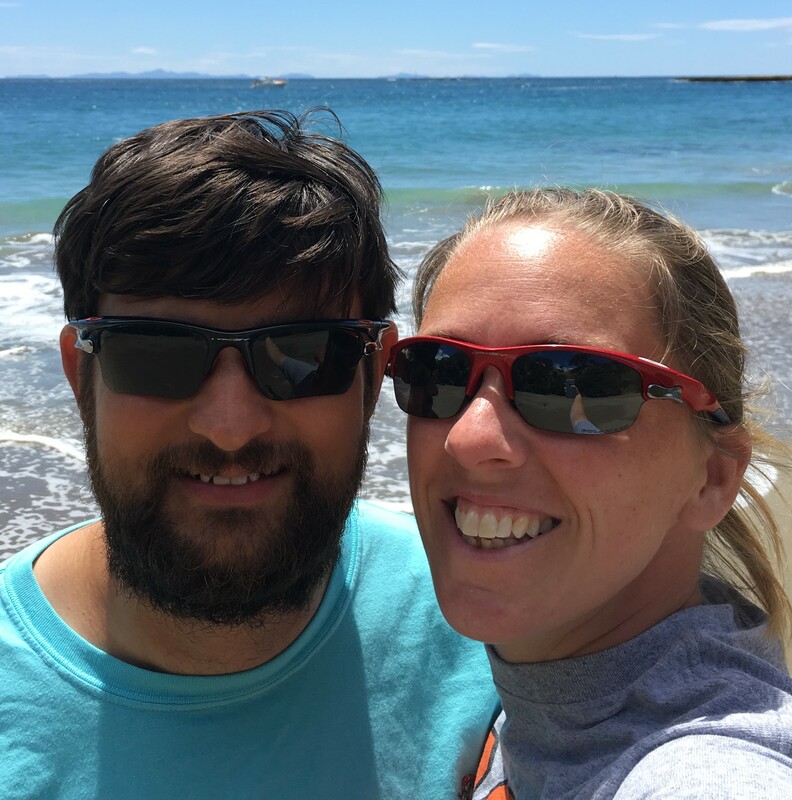 If you’ve been following this blog you’ll be aware of my defeat in the marina with Ducky on the quarter. Not my finest moment, but I’m sure it was entertaining to many. 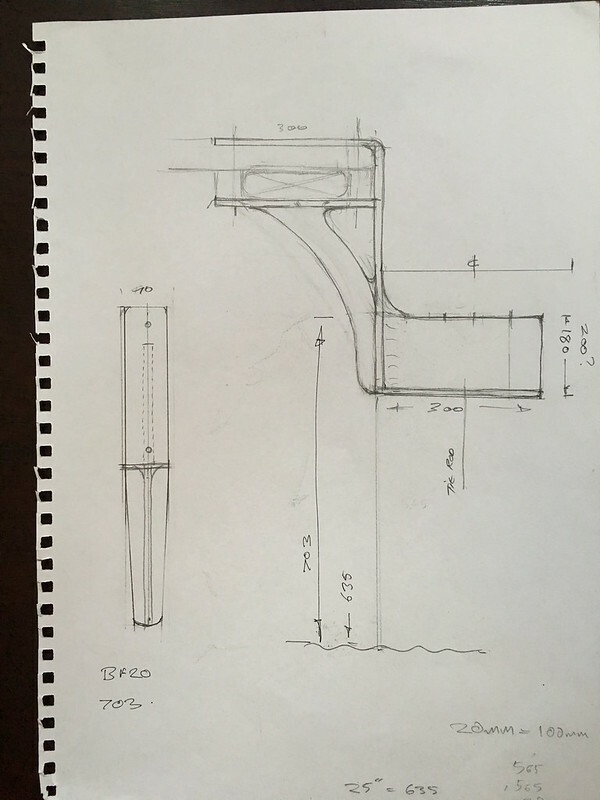 I’ve had suggestions of putting a well in the lazaret (with a plywood box), I’ve had suggestions of sacrificing the sits tub for an inboard engine. I’ve always listened and considered things, but honestly when people tell me to put a hole in Taleisin they normally lose me. The day will come when I finally put a hole in her somewhere, but not yet. I’ve spent many hours researching motors, electric and conventional. I’ve made new friends on the internet while doing this. I looked at inboard options and outboard options. I looked at electric pod motors, electric trolling motors. I did thought experiments with these different types of motors. I calculated costs vs benefits. Weight, practicality and anything else I could think of. 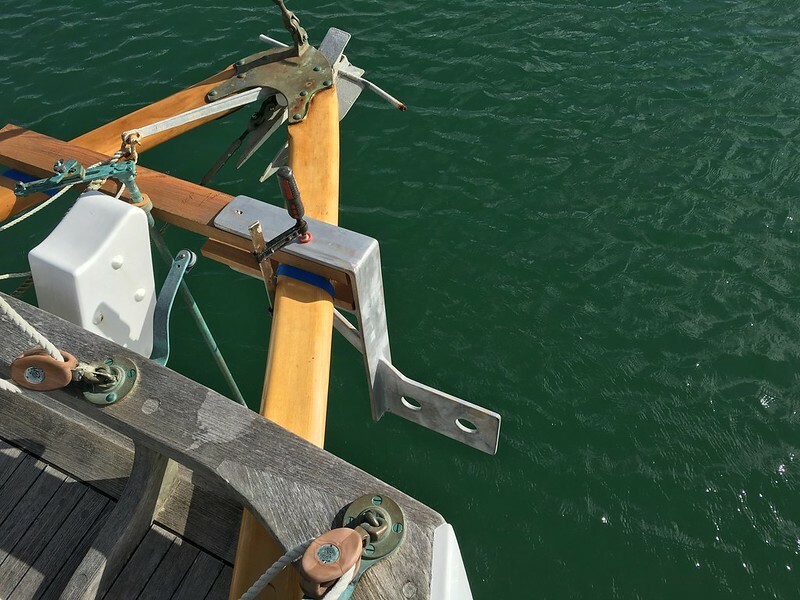 I thought about different ways to mount the motor, using existing chainplates and rigging, mounting it on the rudder, hanging it from the bumpkin on a cantilever. Where would holes need to be made in order to make it viable. I considered a side mounted motor, but rejected that idea because when I had Ducky on the quarter it was very hard to get steerage as low speed. Always at some point I’d stop and ask myself, what’s the objective? What am I trying to achieve with all of this. The answer is never, to give Taleisin an engine. The answer is always to facilitate learning and accelerate our way up the learning cliff (that’s when the curve goes up and backwards). Taleisin is not a beginners boat, that means we can’t take the usual approach to learning with her. When I got completely and utterly defeated by Taleisin in the marina Annie suggested that we get a mooring and try that approach first (I actually listened that time). It worked and we learnt quite a bit while on the mooring. The reality though, we didn’t get out on Taleisin as much as we should have. Getting to and from the mooring was a long and slow process. Keeping the objective in mind, this was the opposite. I’d be lying if I said that I didn’t drive by Taleisin every time the weather was acting up, to check on her. I probably would not be able to do much in the event that something went wrong, but I checked none the less. Every storm I’d be laying awake at night worrying about Taleisin on the mooring (for the record, worrying does nothing but make you feel bad). With the seasons changing, I said to Annie we’re going back in the marina for winter. This wasn’t a hard sell as Annie must have been concerned too. So we waited for a nice day to move Taleisin back into the marina. This of course left us stuck in the marina again. I started on solving the motor challenge again. If it’s easy to come and go from the marina, we’ll use Taleisin a lot more, and we’ll learn faster! About the same time Lin sent me an email saying that there’s some people she thinks we’d enjoy meeting, they live on their wooden boat around the corner from Taleisin. I called Doug and went to his boat Karie L. We hit it off immediately and it wasn’t long before I started talking about my idea for a motor mount. Doug was kind enough to help me with it. 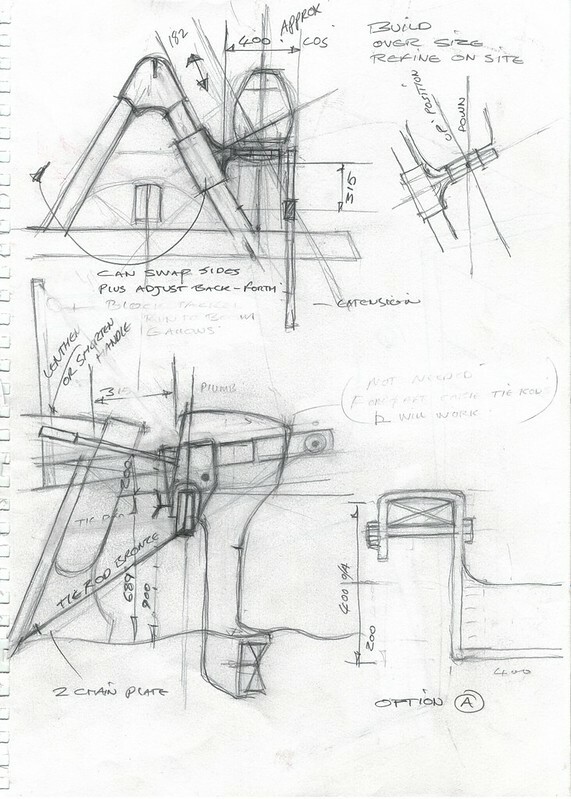 Doug produced a lot of conceptual drawings which eventually lead to the design that’s now mounted on Taleisin’s bumpkin. Doug made a pattern for the design and we got it cast in bronze, I’m very happy with the results! 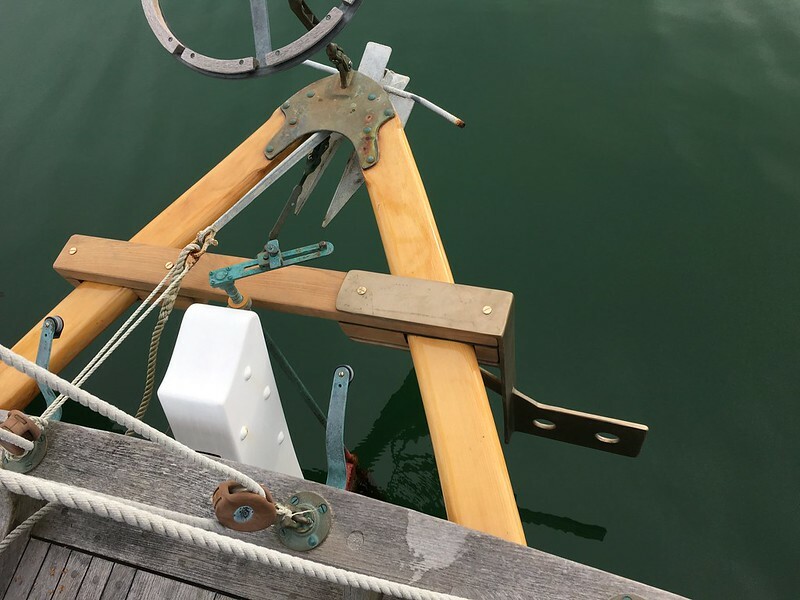 The essence of the mount is a length of teak across the bumpkin, behind the rudder. This is clamped onto the bumpkin with 2 wooden blocks made from teak with bronze bolts through it on either side of the spruce timber of the bumpkin. We’ve put some rubber padding between the timbers to protect it. The bronze casting slides over the timbers on the port side (in theory this is a reversible bracket). 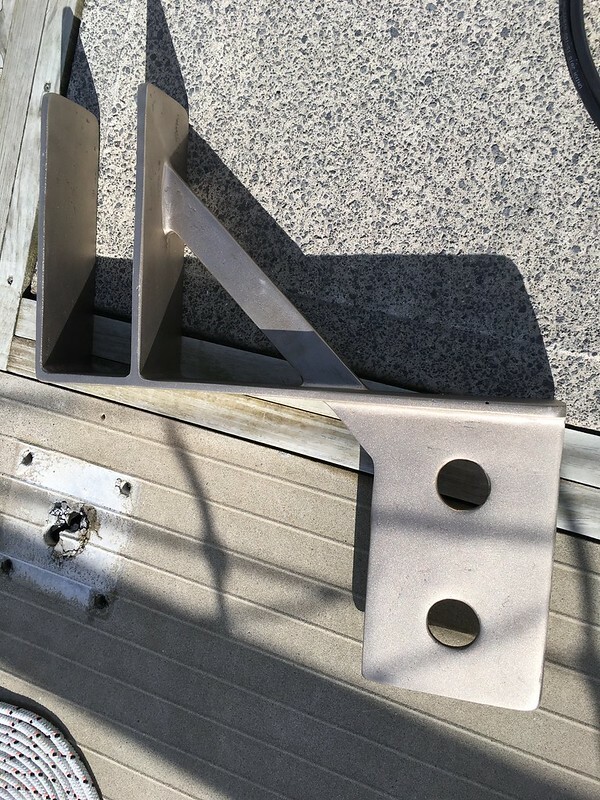 Timber pads are glued on with sikaflex on the mounting plate, a couple of rivets are also in place as a “just in case”. We bought a 20HP Honda outboard. The motor has a 20” shaft, the dealer was great and installed a 5” spacer to make this a 25” shaft motor, none of this works without a 25” shaft motor! With a bit of fun and games we eventually managed to get the motor onto the bracket. The Leopard Seal in the marina came to investigate while we were at it, it was likely the banging noise from riveting. We started the motor up and had it running in forward and reverse. I had always known that there would be flex in the mount if it’s not braced. 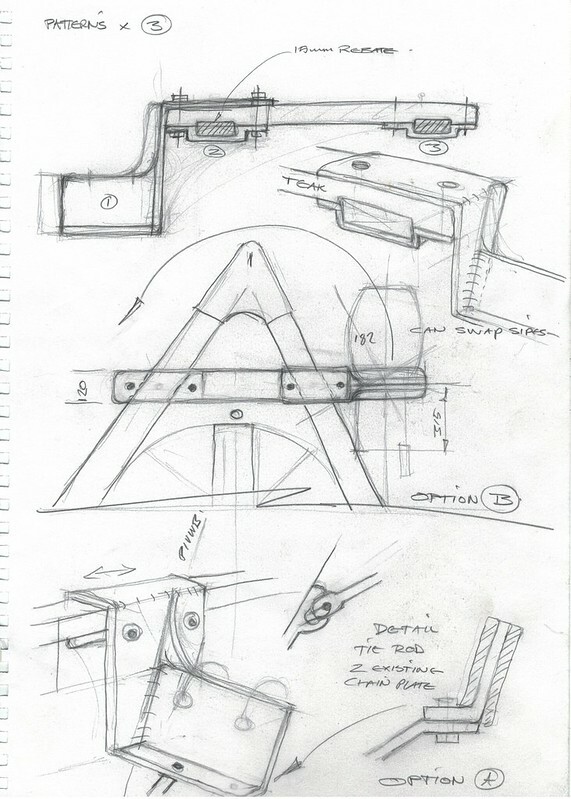 Doug’s original concept had a tie-rod from the chain plate to the mounting plate. It was clear that this would be required. At this point rather than jumping in and getting a tie-rod in place I thought I’d take a step back and play around with a few different ideas first. In my original idea there was a brace that pushed up against the transom and it lashings to the chain plate and taffrail. While thinking about all of this it dawned on me that I didn’t take shock loading into consideration. The motor weighs 52kg. Shock loading could turn that into 500kg static load equivalent without too much effort (think gravity when bouncing up and down over waves). Taking a wave against the motor is another thing all together - I haven’t even started to think about mitigating that scenario, other than don’t get into the situation in the first place. So my thinking cap went on again. I decided to get some cheap timber for a prototype from the off-cuts bin at the local hardware store. I knocked something up that’s functional. I bolted it on with 2 eye bolts. I got some Dyneema to create rigging of some sorts to keep the brace up against the transom while in forward and reverse. I added a couple of turn buckles so I could tighten things up. I used a sewn webbing sling with a larks foot on the taffrail. I added a shackle between the sling and the Dyneema to avoid friction melting through both (it’s very scary how easy this is to do, it’s something I learnt from rock climbing). The shackle is tri-loaded which is not ideal, but I doubt it would be the first point of failure. 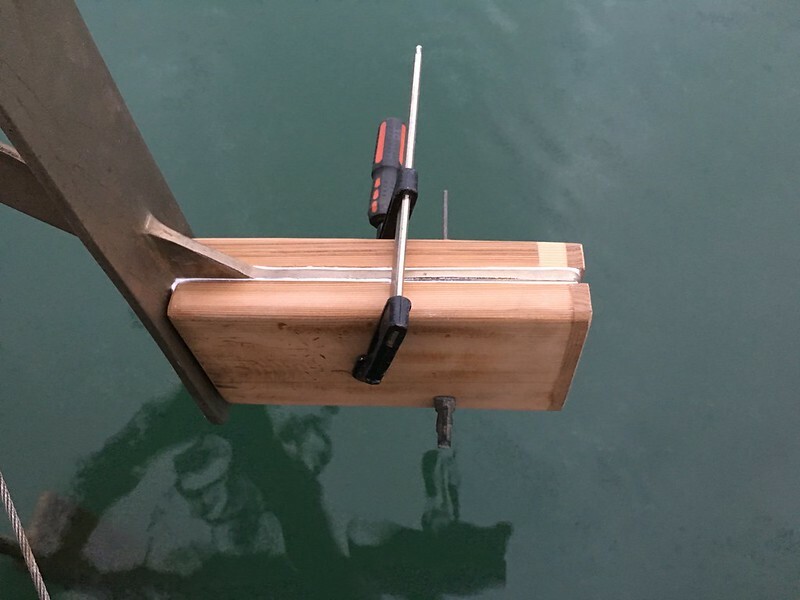 One lashing is around the brace to lift it up and wedge it in place against the transom. The other is to the eyebolt which takes some of the motor load. This configuration gives me the triangle structure I was after to create a strong support. This rig serves 2 purposes. The first is that it stops the mount flexing under the motor’s torque. The second is that it transfers some of the load from the bumpkin to the taffrail for shock loading. With all of this in place, Paul, another friend I made because of Taleisin walked by on Friday afternoon just as I was finishing everything up. He had a quick look and thought it looked good. The next thing he asked if I was keen to give it a go. We let the mooring lines go and start backing Taleisin out. Paul asked if the bowsprit was clear from the pilings as we’re about to turn into the fairway. 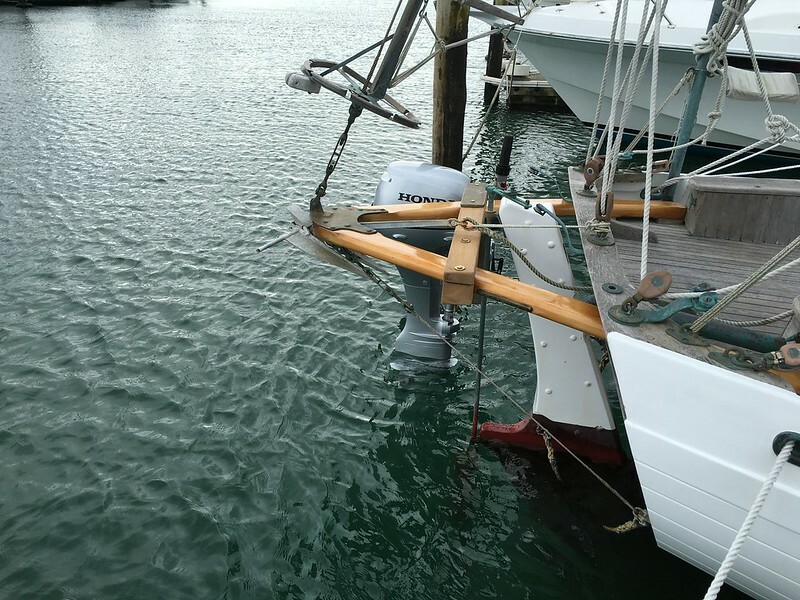 I said the bowsprit was clear. 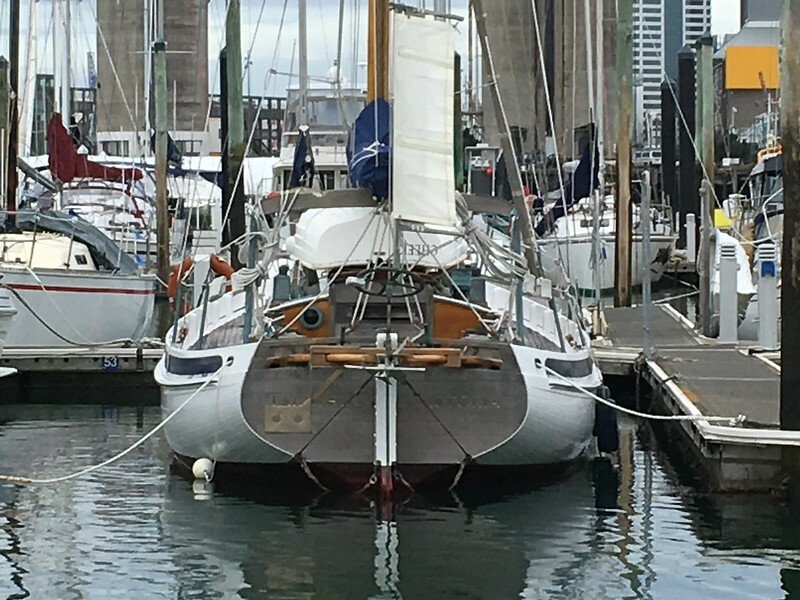 Paul asked if we were good to go, and suddenly I noticed that the floating line between the bow and stern mooring lines were caught on the lifelines. I ran to release it. It wasn’t possible as I had undone the lifelines to get the motor on board and had tangled the floating line in the process. This meant that we’re still attached to the dock. Quick, put her in forward, I yelled. We got Taleisin stopped so I could undo the lifelines. Paul was up at the bow fending so that the wind wouldn’t blow us into the launch next to us. I got the lifelines undone and released us without too much trouble. Disaster averted! Back to getting Taleisin out. 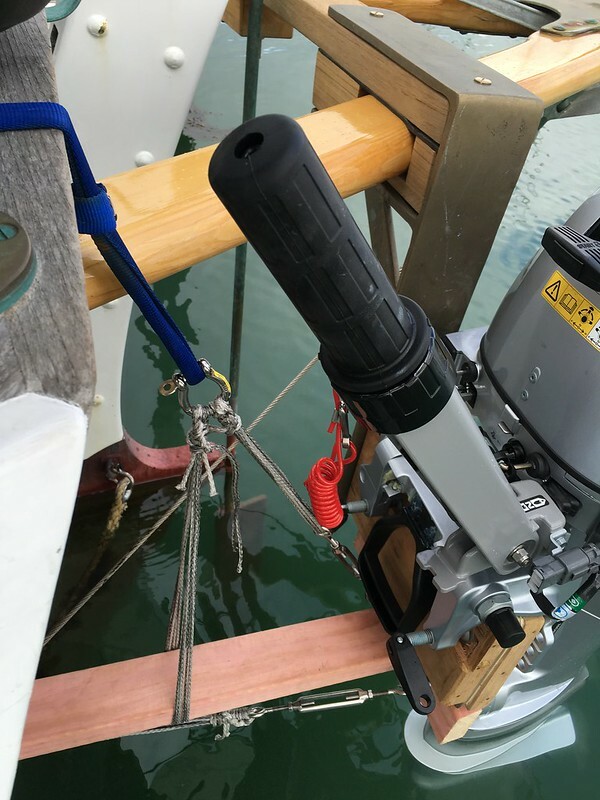 We backed out and were able to use the outboard as a bit of a stern thruster by turning it with it’s tiller. At this point it started to feel like cheating. It was actually easy moving Taleisin. We left the fairway without any issue. The motor was not pushing Taleisin’s bow off like we experienced with ducky on the quarter. It was actually easy to move her! We took Taleisin out into the harbour with her new motor, pushing against a 2 knot current we were making 4 knots over the ground. Everything seemed to work as expected. It’s worth noting that Paul had a blast, we both enjoyed the experience! Paul mentioned that we were busy making history. Coming back into the berth was not terribly difficult either, compared to previous experiences! It’s a little premature to call it a complete success. I still need to see how things behave when under sail. 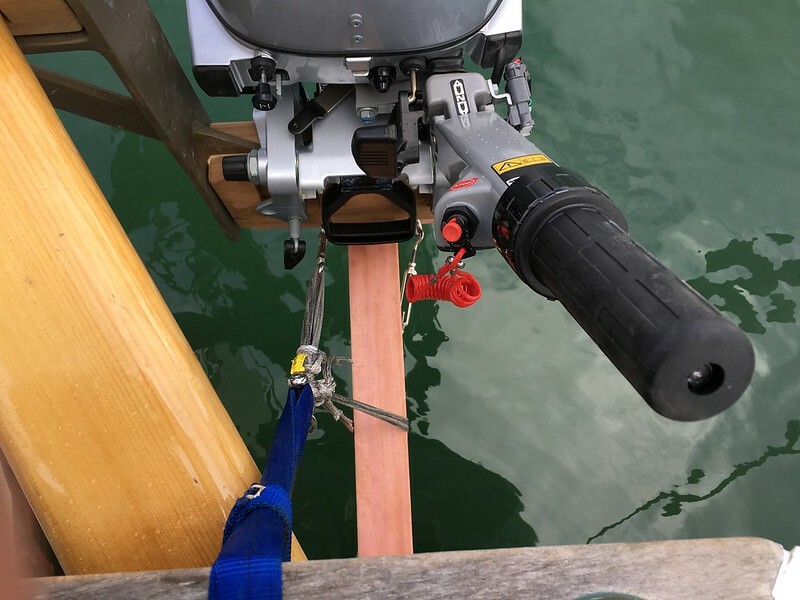 The interesting thing I noticed is that while pushing along under motor the bit of timber used to brace against the transom actually gets submerged at times. If the motor did not have a 25” shaft I suspect it would be in danger of drowning. While I don’t expect any issues there’s a chance that things might get interesting on a starboard tack. The only way to find this out is to give it a try. 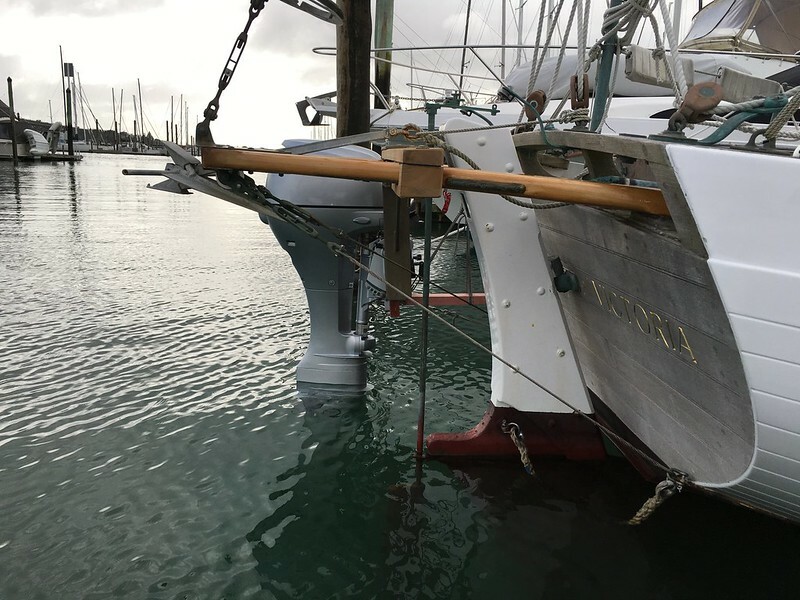 Given that the stern doesn’t go under water when sailing normally there’s no real reason to believe the motor is in danger. We’ll be running with the motor as is for the time being so I can figure out what the next best step would be. I’m currently thinking that a tie-rod system of some sort would be a good way to go. It’s been pointed out to me that the taffrail might not be as strong as it looks. For this I might figure out a way to get a block underneath it between the deck and the taffrail to strengthen it. The other option I am thinking about with regard to strenthening the whole lot is to replace the wire rigging underneath the bumpkin with a couple of tie-rods. I wont be making any decisions in a hurry and will test the system in gentle conditions first. The next problem I’ll be trying to solve, is a method for lifting the motor on board so I can store is down below in the lazaret. If I can devise a simple system for this it would become possible to bring the motor up on deck without much drama and most of these concerns might go away. Provided of course it becomes easy to do under way - which is probably far from trivial. What I like about this approach is that I’ve not altered Taleisin, so if I want to change anything I can without consequences. I can fine tune and evolve this into more if I want to or we can use it to learn enough to become confident in moving Taleisin the way she was intended to be moved. We have more options with this solution than the alternatives, it’s not possible to “unmake” holes. It’s far from a perfect solution, but it’s very pragmatic. It looks like it belongs on the boat too, which is a nice bonus. A big thank you to everybody who has had any discussions with me regarding motors and mounting them. It all added up and this is the sum total of all those conversations, even if you suggested putting a hole in the boat it was all valuable. We certainly would not have gotten this far without all the input and ideas from everybody. If anybody reading this sees a major flaw in my thinking, please point it out! If you have any clever idea, I’d love to hear them! If and when I make significant changes I’ll do a follow up blog post if there’s any interest in it.